From #1 New York Times bestselling author Stephen King, a powerful tale of grief, of love's enduring bonds, and the haunting secrets of the past. Set in the Maine territory King has made mythic, Bag of Bones recounts the plight of forty-year-old bestselling novelist Mike Noonan, who is unable to stop grieving following the sudden death of his wife Jo, and who can no longer bear to face the blank screen of his computer. Now his nights are plagued by vivid nightmares, all set at the Maine summerhouse he calls Sara Laughs. Despite these dreams, or perhaps because of them, Mike returns to the lakeside getaway. There he finds his beloved Yankee town held in the grip of a powerful millionaire, Max Devore, who will do anything to take his three-year-old granddaughter away from her widowed young mother. As Mike is drawn into their struggle, as he falls in love with both mother and child, he is also drawn into the mystery of Sara Laughs, now the site of ghostly visitations, ever-escalating nightmares, and the sudden recovery of his writing ability. What are the forces that have been unleashed here—and what do they want of Mike Noonan? 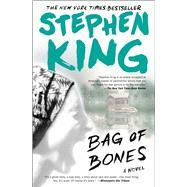 First published in 1998, Bag of Bones was an instant #1 New York Times bestseller. It was lauded at its publication as “hands down, Stephen King’s most narratively subversive fiction” (Entertainment Weekly) and his “most ambitious novel” (The Atlanta Journal-Constitution).